I know Blake Bailor did one of these awhile back and I thought it would be a cool idea for me to do one as well. My pro scooter really never changes that much. The only time I change something is after awhile when its really worn down. 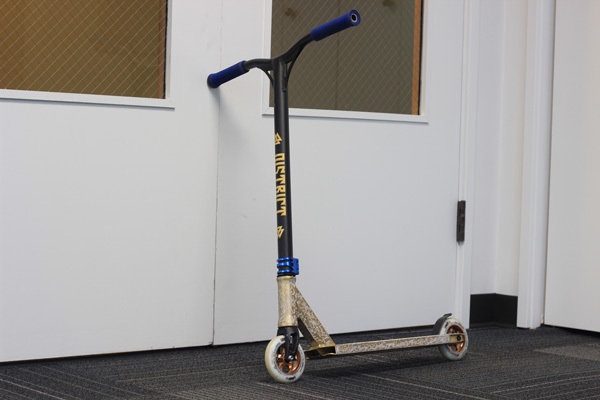 Check out my in depth scooter check below and see what keeps me rollin. 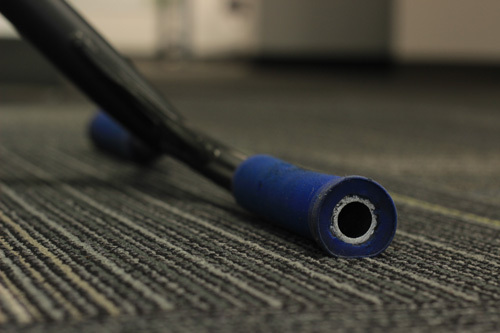 For my grips I like something soft and durable, yet long lasting. 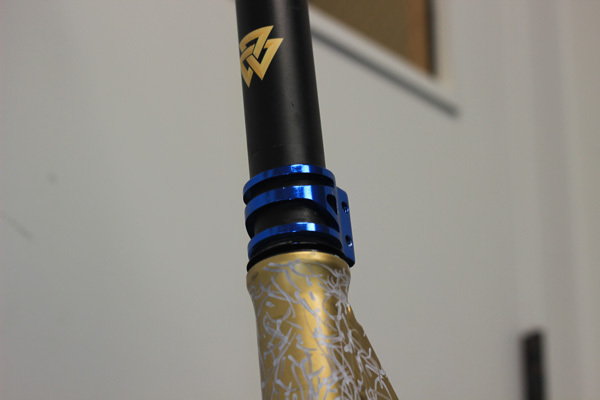 Thats why I ride blue ODI softies ( no bar ends because I don't have any LOL ). I really enjoy the feel of aluminum bars. 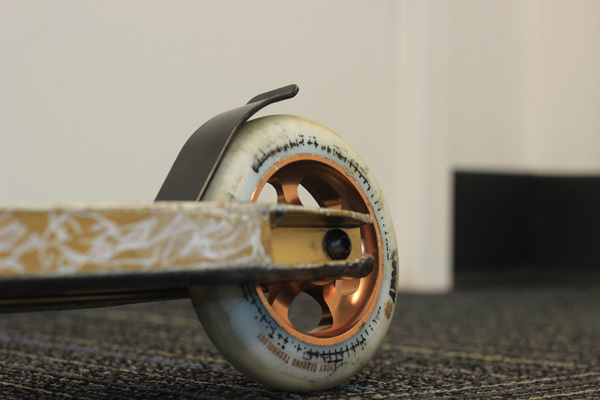 They weigh almost nothing and are super easy to barspin. Thats why the district Helmeri Pirinen signature aluminum bars are a perfect fit for me ( 21 wide 22 tall ). I'm rocking the blue Lucky double clamp. Its super sleek and weighs barely anything. It also matches my grips and keeps my scooter super dialed. I'm riding an orbit fsa integrated headset ( black ). Nothing really to say about this. Its smooth fast, and never breaks. For my fork I got the Jessee Ikedah signature SOBv2 fork in black. It’s perfect for foot jams and nose blunts, and I'm always down to support the homie. Also got the Envy IHC compression. 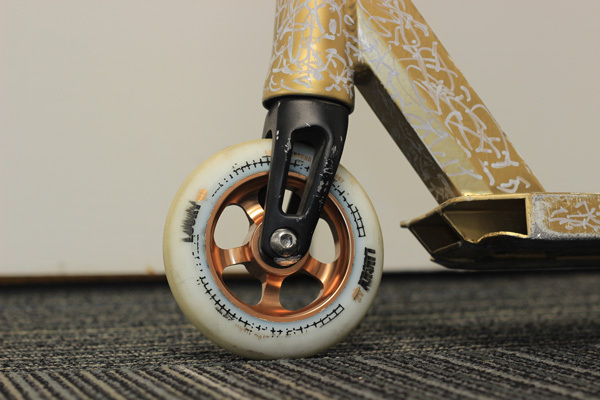 I love the atom two wheels so much thats why I’m riding them in gold. There so smooth that it feels like you're riding on clouds. They have never ovalized, dehubbed or chunked on me either. Now to the best part about my scooter, the deck. 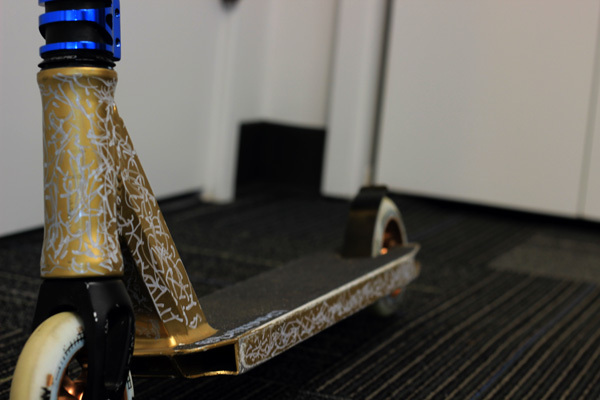 I’m riding a white crew deck that I spray painted gold to match my bars and wheels. I also scribbled on it with white paint pen haha. I love this thing so much. The dimensions are perfect for me! 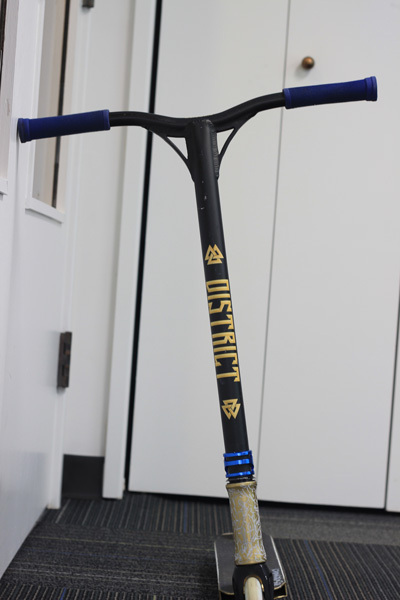 ( 19.5 long by 4 wide ) It whips around so good and is great for 50-50s and any type of grinds. I would highly recommend this deck! Also rocking that stock black Lucky griptape. Last but not least the brake. I got a black Lucky flex fender. It gets the job done without any problems.